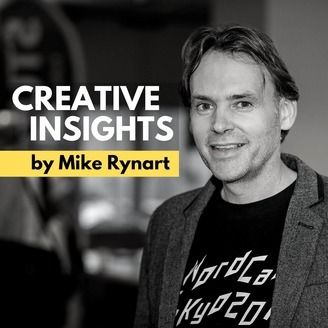 Mike Rynart is a Web Expert helping people to become more effective online. He has been developing for the Web since 2000. 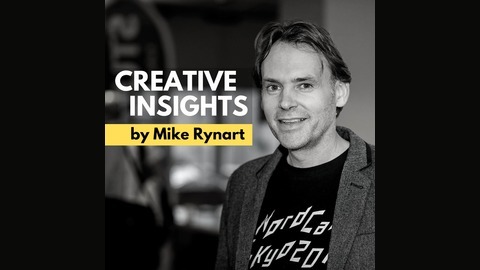 In this show, Mike and creative entrepreneurs share stories designed to help you gain creative insights to grow your business and reach your goals. On this episode of Creative Insights, I talk about how brands can generate big ideas that create real change with an expert on advertising: Steve Babcock. Steve Babcock is the Chief Creative Officer of VaynerMedia – the world famous marketing and communications agency founded by Gary Vaynerchuk (AKA Gary Vee, AKA Gary Vay-ner-chuk). Steve Babcock’s mother has never understood what he does for a living. She knows it’s something creative. And something that requires a lot of travel. She knows he has a fancy title like Chief Creative something. And that he invented the Pizza Tracker for Domino’s, even though she’s never ordered a pizza online. She knows he’s done advertising stuff for a lot of big organizations like American Express, Volkswagen, KraftHeinz, Best Buy, JCPenney, and Samsung. But she couldn’t tell you exactly what role he played in the process. On any of it. She knows he got some fancy trophies from France. She’s very proud of those. However, she’s a little foggy on the actual job responsibilities of Steve’s career. For example, she doesn’t know that he’s held pretty much every title from Junior Copywriter to Chief Creative Officer at agencies like EURO RSCG, Struck, Crispin Porter Bogusky, and Evolution Bureau. She knows he now lives in New York and works for a big firm called VaynerMedia. But that’s pretty much it. In this episode, Steve will share his story and how to generate big ideas that create real change. ⭐ How Unicorns aren’t found. They’re made. Turning your existing team into unicorns. ⭐ What kind of skill sets are most important this moment in the creative industry. Also, we talked about what a typical day looks like at VaynerMedia and what it’s like working with the hustle king himself, GaryVee. So get ready to learn how to generate big ideas that create real change with Steve Babcock.